"If I had a talent for fiction, Doctor Olaf van Schuler's Brain is the book I'd dream of writing. Kirsten Menger Anderson's writing floors me. To read her luminous prose applied to the grotesqueries of the characters is an unforgettable literary experience." "The strange, wonderful stories of Doctor Olaf van Schuler's Brain introduce us to the tremendously gifted Kirsten Menger-Anderson, a writer whose subject is nothing less than the diagnosis and cure of the human malady. We follow twelve generations of New York City's Steenwycks family through their forays into phrenology, mesmerism, radium therapy and similar misadventures, a historically rich narrative that Menger-Anderson delivers in striking, elegant prose and with a sure eye for detail. This is a remarkable debut by a writer to watch." "This satisfying and wholly original collection is a true pleasure to read. In seamless prose, Menger-Anderson captures a panoramic New York spanning five centuries, where surgeons and tavern owners, Macy's clerks and suffragettes, gangsters and prison reformers all grapple with mysteries of science and of the soul. Menger-Anderson navigates her terrain with self-assured ease, and each story informs the others so that the sum is truly greater than its parts." "Spellbinding ... this book by the gifted new writer Kirsten Menger-Anderson about a family fated to madness, a family of doctors driven by an inner compulsion to heal is like nothing else you've ever read before. It's truly original and impossible to put down." The history of medicine and medical quackery, and one's family personal history within that context, conjoin in this startlingly effective, even educational, novel... For the most part, medical history cannot help but be interesting, and this author brings the subject to a fascinating glow; by extension, the story of the Steenwyck family becomes one thread of American cultural history. "[This] savvy, sordid string of tales becomes a psychological spellbinder about the good, the bad, and the mad in all of us." "Menger-Anderson's fictional take on the harsh realities of old-world medical science is at once grotesque and utterly compelling, as are her madcap characters, who desire so earnestly to find a cure--whatever the cost." "'Doctor Olaf Van Schuler's Brain' is much more than a compendium of medical mistakes and the odd side-roads taken by medical scientists in pursuit of understanding how we work. Menger-Anderson (even her name has a steampunk feel) gets to the human element in all this history, that combination of pride and fear that drives us to believe in something, well, unadvisable. Ourselves, alas." "This little book isn't for everyone, but I sure loved it. If, like me, you've thought from time to time that under our controlled demeanors, our learning and good manners, we're all about one millimeter away from being stark, staring mad, and that the doctors who set up to treat us are probably just as crazy as the rest of us, if not more so, you'll sigh and smile when you read this." "A bold first collection chronicling a family of eccentric physicians. . . Menger-Anderson has made an impressive debut." "Dr. Olaf Van Schuler's Brain" by Kirsten Menger-Anderson is a sensational first novel that masterfully intertwines stories of medical fantasia with the intriguing history of New York City. Spanning 342 years and 13 generations of New York medical men (and eventually women once the mid 19th century hit), "Dr. Olaf Van Schuler's Brain" is a fascinating take on the usual breed of historical fiction. . . . Menger-Anderson is in possession of a great literary skill." "An array of arresting, thoughtful, and touching moments." "A fascinating kaleidoscope ride across generations of physicians and their patients. The writing is vivid and entertaining, revealing lifetimes and worldviews in a few carefully chosen details. . . . The author's zest for the historical details shines throughout the collection.. . . . In this quirky, moving collection, Menger-Anderson illustrates the power of medicine - and family." "An ingenious and appealing collection of linked stories. . . . Menger-Anderson brings a writerly order to the messiness of our minds." "Within a highly atmospheric framework the ghosts of Robert Louis Stevenson, Washington Irving and Mark Twain haunt the stories, Menger-Anderson delicately angles toward a cautionary tale for the modern world." "Menger-Anderson has not only done her research -- deftly documenting three centuries of medical quackery -- but she also knows how to weave a tale. She holds the reader spellbound from the first slice into a corpse's brain to the final probe of genetic research. " "[A] moving portrait not only of the history of medicine but of the growth and progress in New York City"
"Science is an elixir that sweeps characters under its spell. Yet the pace of [DOCTOR OLAF VAN SCHULER''S BRAIN] is driven as much, if not more, by the reader's romantic appetite--by an itch to discover how each story is romantically resolved and connected to the long lineage." "At the heart of the stories is a deep sympathy for the fallibility of the human condition. However damaging some of the characters prove to be (both to themselves and others), they are all comprehensible... a deliciously good read. " "Darkly funny, often sad, frequently frightening, and sometimes hopeful...the product of a gifted literary writer." "[A] fascinating look at how beliefs about medicine and New York society have changed. . . Each story is a tasty morsel." "A thriller that spans five centuries, Doctor Olaf Van Schuler's Brain is entertaining and thought provoking. . . This book is eerie, smart, unique, and very delicately crafted, telling many stories in every layer of time. . . Truly a pleasure to read." "Menger-Anderson has written an intelligent and humorous history of the science of brains--and the brains of science." "The book Doctor Olaf van Schuler's Brain is the first novel by Kirsten Menger-Anderson, and it's a gem...The book is an adventure of medicine in historical context. The stories are fun; the history of medicine, fascinating." "Intelligent, imaginative, and consummately researched"
Have a medical problem? Ask Dr. Olaf! 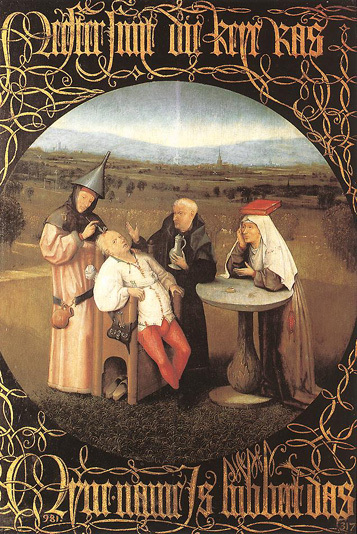 The above painting, which inspired one of the stories in Dr. Olaf, is called "The Extraction of the Stone of Madness" by Hieronymus Bosch.